News that a retail store in Norwich - 100 miles from London - is closing is unlikely to attract much attention. 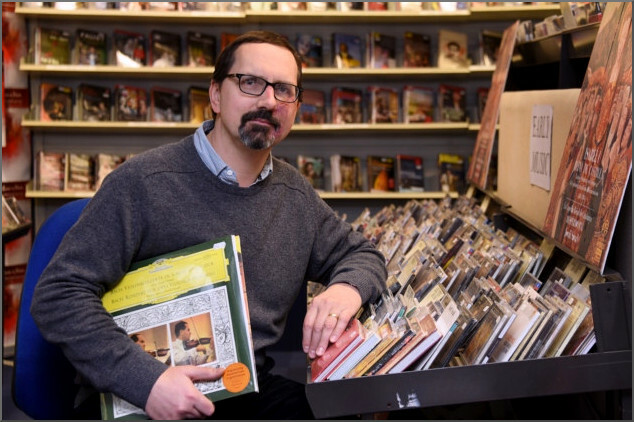 But the impending closure of Prelude Records, one of the few independent stores in the UK run by classical musicians for music lovers, will impact on the many readers of this blog all around the world. Many of the posts On An Overgrown Path have been inspired by chance discoveries in Prelude; the kind of chance discoveries which are simply not possible in algorithm-driven online stores. My life will undoubtedly be diminished by the closure of Prelude Records. So the Buddhist doctrine of dependent origination means the content of this blog - how long before it too goes the way of Prelude? - will be diminished, and that diminution will affect readers all round the world. Not to mention of course the musicians and small record companies whose viability will be diminished by a further reinforcement of the financial stranglehold of Apple Music, Spotify and other online gatekeepers. Proprietor Andrew Cane - seen above - explains the closure by a decline in business caused by downloads and streaming and says "It's not a sudden change, it's been a gradual erosion. The people who are still regulars are wonderful, but sadly, that's not enough". A civilization usually doesn't die from being invaded from the outside, but unless it creates culture which nourishes the evolution of the creative spirit, a civilization invariably commits suicide. Photo via EDP. Any copyrighted material is included as "fair use" for critical analysis only, and will be removed at the request of copyright owner(s). Also reluctantly on Facebook and Twitter. Performing ensembles in Norfolk will also suffer from the closure of Prelude Records as it provides a box office facility for local classical venues. Words are inadequate to describe how much I learned from a store like this while growing up in Washington, D.C. The far-reaching influence of such record stores upon music lovers, musicians and their programming is belied and dwarfed by their always modest physical size. I think people would do well to look at the developments that occurred during the decline of the Roman Empire; consider the portents of a Khali Yuga; look at the present state of the world. And then be very, very afraid. As an ex member of staff, this is especially sad news. It would not be an exaggeration to say I learned as much or more working there than on my 3 year classical music degree at UEA. Listening to hours of quality recordings would inspire me to explore this music in the library in greater depth, taking me on many 'paths' I wouldn't have known otherwise. A sad loss for music in Norwich and further afield. I was on the same small business course as Andrew back in 1985. I wish I'd volunteered to help him / work for him. He certainly made the vision a reality, and it was a great pleasure to know him. I am taking some comfort that he has endured over the decades and hope he can stay online. What a wonderful experience it must have been for him, his customers and the artistes he sponsored.